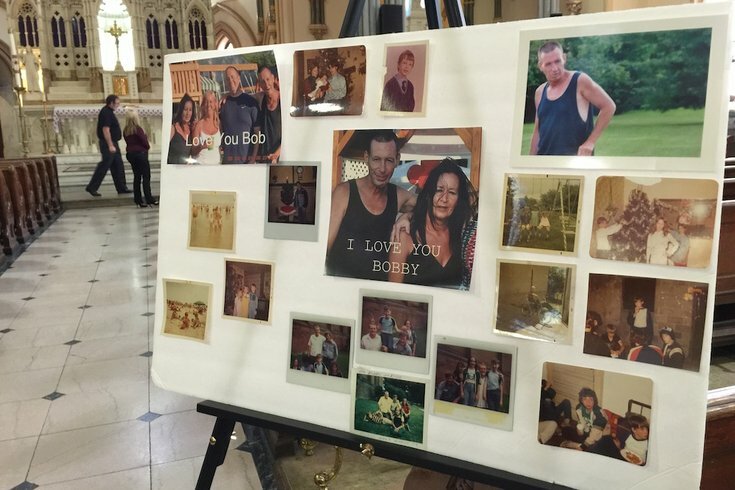 A photo collage of Robert Barnes images was on display at the funeral Mass in Manayunk. Robert Barnes’ family and friends will wait a little longer for the case against three women charged with murder in connection with his death to make its way to court. Diane Barnes, sister of the 51-year-old Roxborough man who died seven months after being brutally attacked by a group outside an Olney gas station, said a preliminary hearing scheduled for Wednesday morning had been delayed a month. She told PhillyVoice an assistant district attorney assigned to the case said that medical examiner’s reports were still being finalized. They should be completed within the next couple weeks. According to court records, the preliminary hearing for the suspects – Aleathea Gillard, 34; Shareena Joachim, 23; and Kaisha Duggins, 24 – has been rescheduled for March 9. The suspects are accused of attacking Barnes outside a Sunoco gas station at Fifth Street and Somerville Avenue on April 7. Footage from nearby surveillance cameras shows a group of three adults and three juveniles beating Barnes with their feet and fists, a hammer, a piece of wood and pepper spray. Three youths – a 12-year-old girl and 13- and 14-year-old boys – were sentenced on assault charges in July. Their charges have since been upgraded, as well, and at least one of them has pleaded guilty to charges including third-degree murder. The assault was allegedly precipitated by Gillard's 10-year-old son claiming Barnes hit him during an argument about who would pump gas for customers, an allegation that investigators later dismissed. Investigators said they later learned that he fell off his bicycle on the way home and made up a story to avoid getting in trouble for being late. Barnes remained comatose in the months after the beating until his death on Nov. 25. In early December, mourners, including Sister Mary Scullion of Project HOME, gathered at Manayunk’s St. John the Baptist Roman Catholic Church to remember a man who battled alcoholism and the perils of homelessness. In the months since Robert Barnes’ death, more than $4,500 has been raised via a GoFundMe campaign to help defray the cost of funeral expenses, and Diane Barnes will soon launch a campaign that would provide the homeless in Philadelphia with sneakers and boots. Diane Barnes said she is currently working out the logistics of how to distribute those sneakers and boots in Philadelphia.